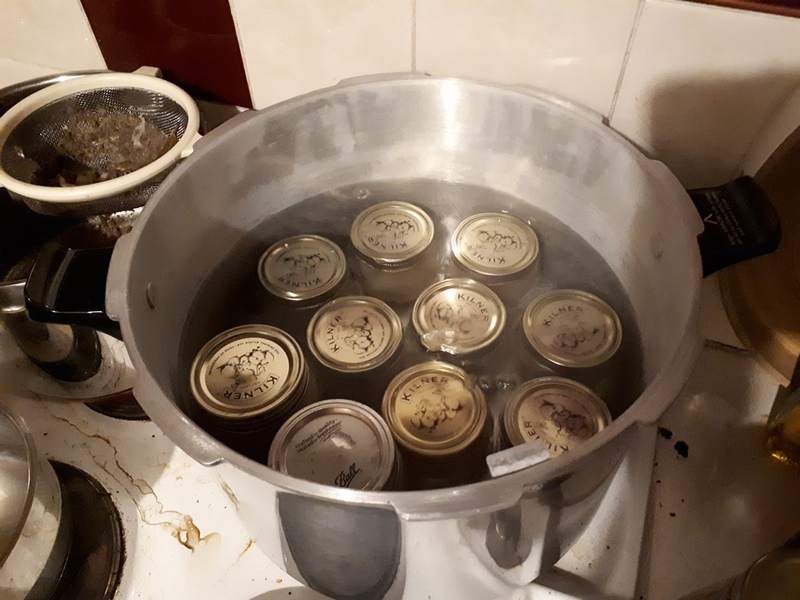 Last night my good friend Kirsty (From rural retreat restoration) came over and we spent the evening canning lamb stock. 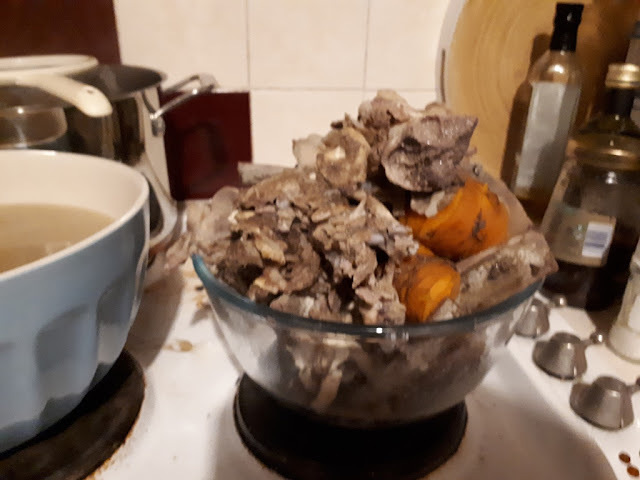 I'd set a number of bones that had been taking up freezer space in a large saucepan along with some carrots and shallots to simmer for a good few hours. Then when Kristy turned up we strained it and sterilised the canning jars. Carefully filling them as far as the book said, we used half pints because it's going to be a fairly strong tasting stock. Then after messing around with the electric hob and it not getting to temperature we used my little camping stove that did it in no time! Then under 10 lb of pressure for 25 minutes they were ready to start cooling down. Only one can didn't seal so not too bad. We're determined to practice more with this canner as it hasn't been used to the fullest yet! I've got lots of chicken carcasses in the freezer so I think a more useful chicken stock next week. What would you do with the lamb stock? I'm thinking of a broth with pearl barley and chunks of fresh granary bread! Good job! 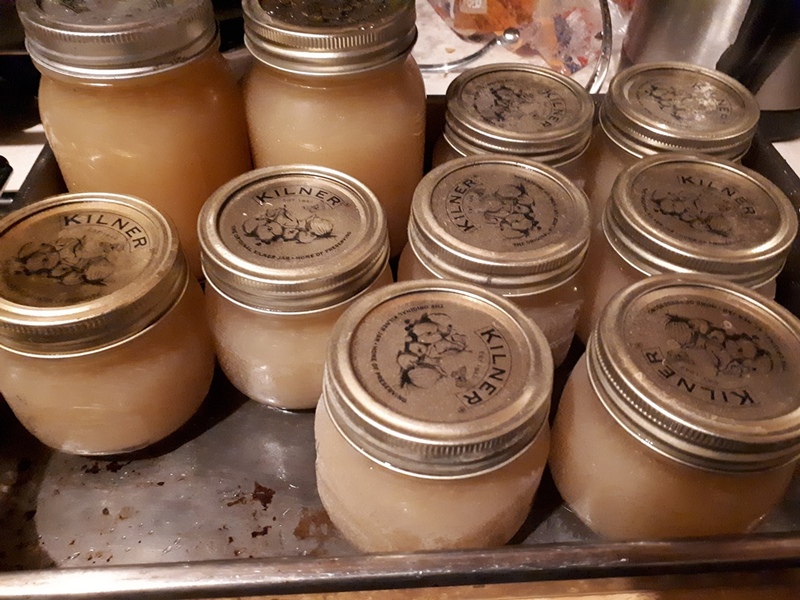 I love having jars of bone broth on my pantry shelves. Soups and stews for sure, and I like it for making gravies and instead of water for cooking grains like rice. It adds wonderful flavor and nutrition too. I should imagine it adds loads of goodness to things, it amazing how much gets chucked away. I really need to do this more often, it was so easy to do! that stock would make a great gravy to go with lamb pies. i make ones with a boiled dough crust that is delicious! Is that a pressure cooker or a canner. would like to know as I am thinking of learning how to can. Do like reading your blog. 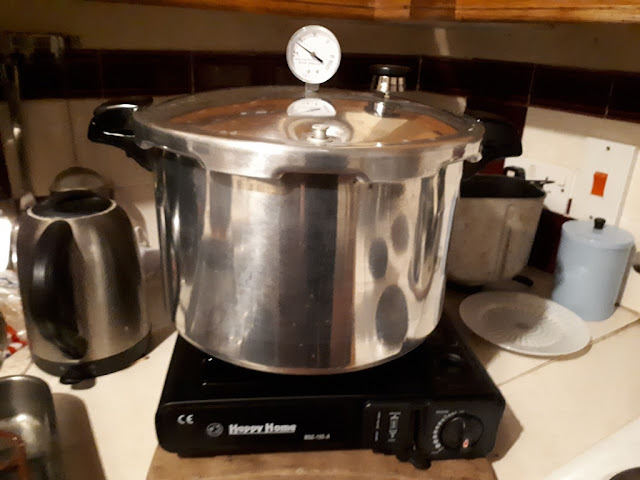 It's a pressure canner but unfortunately it's not mine, it's my friends but I get to use it! Yeah, I'm nervous of it but we follow the instructions so should be fine! Don't be nervous! Follow the basic guides of "tried and true"recipes from reputable sources and don't leave the stove for anytime till you get use to the apparatus and develop a routine! Hi, my name is Danny. I'm 55 years old and have three pc batches under my belt since last harvest here in east central Illinois America. Green beans, smoked turkey stock and 3/4 inch cubed smoked cured fully cooked ham! I'm not sure what sort of gvt food safety programs there is over there, but we have a few good resources over here. I will gather links if anyone is interested. I also can at 10lbs. My elevation is roughly 800'AMSL CHEERS! Now that you have a pressure canner you can can all those veggies that take up so much room in the freezer! It does a great job on corn, beans, asparagus, carrots, beets, potatoes and on and on. Great to can big batches of soup. Looking forward to see what you do. I was given part of a lamb carcass this Christmas and the freezer was already pretty full. So had to find a use for stock quickly. 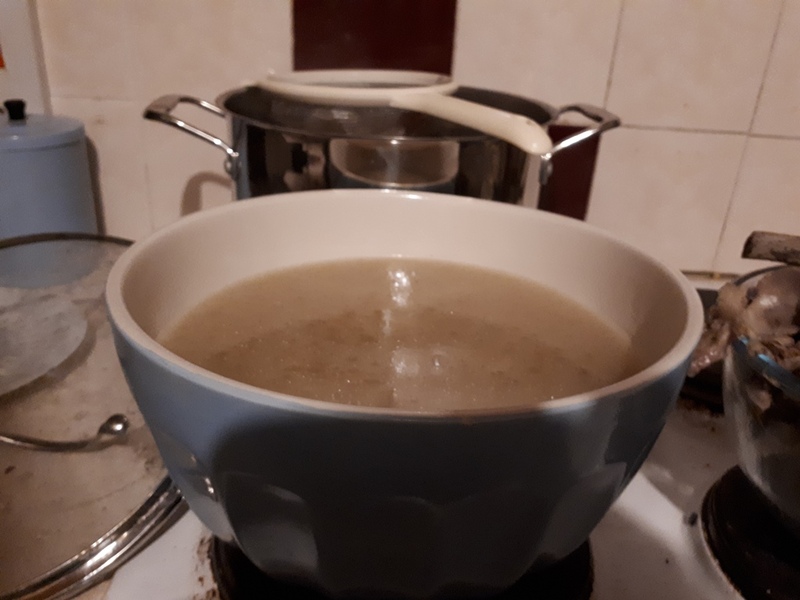 There is a Greek soup for lemon and lamb which is quite interesting but I mainly used the stock to cook lamb curries, shepherds pie and tagines with.